“HOW DO I GET MY CHILD TO SLEEP THROUGH THE NIGHT? !” is the thinly-veiled message under the surface of many of the emails that I get about sleep. And I don’t blame you. I don’t claim to be a magician in this regard, although I did get incredibly, amazingly lucky – my daughter put in her first eight-hour night at six weeks old, and has regularly slept through the night for longer than I can remember. I’m really genuinely not sure I could parent if things weren’t like this. But today’s episode is about the data, not about anecdata. As I started researching this topic it became clear that sleep is driven to an incredible extent by cultural preferences. Some (Western) psychologists advocate for letting children Cry It Out, while people in many cultures around the world see putting a child to sleep in their own room (never mind allowing them to cry) as tantamount to child abuse. So: can we get our children to sleep more? Is bed-sharing inherently bad? Does Cry It Out harm the child in some way? Let’s find out! Amoabeng, A.O. (2010). The changes and effect of stress hormone cortisol during extreme diet and exercise. Unpublished Master’s thesis. Boston, MA: Boston University. Bernier, A., Carlson, S. M., Bordeleau, S., & Carrier, J. (2010). Relations between physiological and cognitive regulatory systems: Infant sleep regulation and subsequent executive functioning. Child Development, 81, 1739–1752. Blampied, N.M. (2013). Functional behavioral analysis of sleep in infants and children. In A. Wolfson & H. Montgomery-Downs (Eds. ), The Oxford handbook of infant, child, and adolescent sleep and behavior. Oxford, U.K.: Oxford University Press. Burnham, M.M. (2013). Co-sleeping and self-soothing during infancy. In A. Wolfson & H. Montgomery-Downs (Eds. ), The Oxford handbook of infant, child, and adolescent sleep and behavior. Oxford, U.K.: Oxford University Press. Chess, S., & Thomas, A. (1984). Origins and evolution of behavior disorders. New York, NY: Brunner/Mazel. Crncec, R., Matthey, S., & Nemeth, D. (2010). Infant sleep problems and emotional health: A review of two behavioral approaches. Journal of Reproductive and Infant Psychology 28(1), 44-54. Ferber, R. (1985). Solve your child’s sleep problems. New York, NY: Simon & Schuster. France, K.G. (1991). Behavior characteristics and security in sleep-disturbed infants treated with extinction. Journal of Pediatric Psychology 17(4), 467-475. Gaddini, R. (1970. Transitional objects and the process of individuation: A study in three different social groups. Journal of the American Academy of Child Psychiatry 9(2), 347-365. Germo, G.G., Goldberg, W.A., & Keller, M.A. (2009). Learning to sleep through the night: Solution or strain for mothers and young children? Infant Mental Health Journal 30(3), 223-244. Giannotti, F., & Cortesi, F. (2009). Family and cultural influences on sleep development. Child and Adolescent Psychiatric Clinics of North America 18(4), 849-861. Hale, L., Parente, V., & Phillips, G.K. (2013). Social determinants of children’s sleep. In A. Wolfson & H. Montgomery-Downs (Eds. ), The Oxford handbook of infant, child, and adolescent sleep and behavior. Oxford, U.K.: Oxford University Press. Healey, D., France, K.G., & Blampied, N.M. (2009). Treating sleep disturbances in infants: What generalizes? Behavioral Interventions 24, 23-41. Hiscock, H., Bayer, J., Gold, L., Hampton, A., Okuomunne, O.C., & Wake, M. (2006). Improving infant sleep and maternal mental health: A cluster randomized trial. Archives of Disease in Childhood 92, 952-958. Hupp, S., & Jewell, J. (2014). Great myths of child development. New York, NY: John Wiley & Sons. Jenni, O.G., & O’Connor, B.B. (2005). Children’s sleep: An interplay between culture and biology. Pediatrics 115(1), 204-216. Lushington, K., Pamula, Y., Martin, J., & Kennedy, J.D. (2013). The relationship between sleep and daytime cognitive/behavioral functioning: Infancy and preschool years. In A. Wolfson & H. Montgomery-Downs (Eds. ), The Oxford handbook of infant, child, and adolescent sleep and behavior. Oxford, U.K.: Oxford University Press. McKenna, J.J., Ball, H.L., & Gettler, L.T. (2007). Mother-infant cosleeping, breastfeeding, and Sudden Infant Death Syndrome: What biological anthropology has discovered about normal infant sleep and pediatric sleep medicine. Yearbook of Physical Anthropology 50, 133-161. Mindell, J.A., Du Mond, C.E., Sadeh, A., Telofski, L.S., Kulkarni, N., & Gunn, E. (2011). Efficacy of an internet-based intervention for infant and toddler sleep disturbances. Sleep 34(4), 451-458B. Pantley, E. (2002). The no-cry sleep solution. New York, NY: Contemporary Books. Price, A.M.H., Wake, M., Ukoumunne, O.C., & Hiscock, H. (2012). Five-year follow-up of harms and benefits of behavioral infant sleep intervention: Randomized trial. Pediatrics 130(4), 643-651. Santos, I.S., Bassani, D.G., Matijasevich, A., Halal, C.S., Del-Ponte, B., Henriquez da Cruz, S., Anselmi, L. Albernaz, E., Fernandes, M., Tovo-Rodriguez, L., Silveira, M.D., & Hallal, P.C. (2016). Infant sleep hygiene counseling (sleep trial): Protocol of a randomized controlled trial. BMC Psychiatry 16(1), 307. Sears, W., Sears, R., Sears, J., & Sears, M. (2005). The baby sleep book. New York, NY: Little, Brown & Company. Super, C.M., & Harkness, S. (2013). Culture and children’s sleep. In A. Wolfson & H. Montgomery-Downs (Eds. ), The Oxford handbook of infant, child, and adolescent sleep and behavior. Oxford, U.K.: Oxford University Press. Teti, D.M., Kim, B.R., Mayer, G., & Countermine, M. (2010). Maternal emotional availability at bedtime predicts infant sleep quality. Journal of Family Psychology 24(3), 307-315. Weinraub, M., Friedman, S.L., Knoke, B., Houts, R., Bender, R.H., Susman, E.J., Bradley, R., & Williams, J. (2012). Patterns of developmental change in infants’ nighttime sleep awakenings from 6 through 26 months of age. Developmental Psychology 48(6), 1511-1528. Hello and welcome to the Your Parenting Mojo podcast. Before we start today, I just wanted to take a minute and mention what happens around here on the weeks when you don’t hear an episode, because I have a suspicion based on my download patterns that most of you are subscribed to the show through iTunes rather than through my website, which means you’re kind of missing out. On the weeks when I don’t publish an episode, I send out a newsletter instead – and this is not just any old newsletter. I keep track of new research and articles related to both child development and education over the previous couple of weeks, and I select the best of them for the newsletter. Then I don’t just tell you about the new studies and articles, but locate them in the rest of the literature on the topic by helping you to understand how the new work adds to our understanding, and what we’re still lacking. I also post calls for questions on topics I’ve already decided to do episodes on (and your questions not only get onto the list of questions that I end up asking the interviewee, but also help me to decide which interviewee to ask in the first place), and mention ideas I’m considering for future episodes to see whether you all are interested in them or not. Finally, I also use the newsletters to do a Q&A on difficult or controversial topics – so after I did the episode on potty training recently, listeners emailed me with their questions and I answered them in a newsletter a few weeks later. Pretty often I end up in an email conversation with the people who write to me about the topics they’re interested in, which I really enjoy and I hope is useful to them as well. 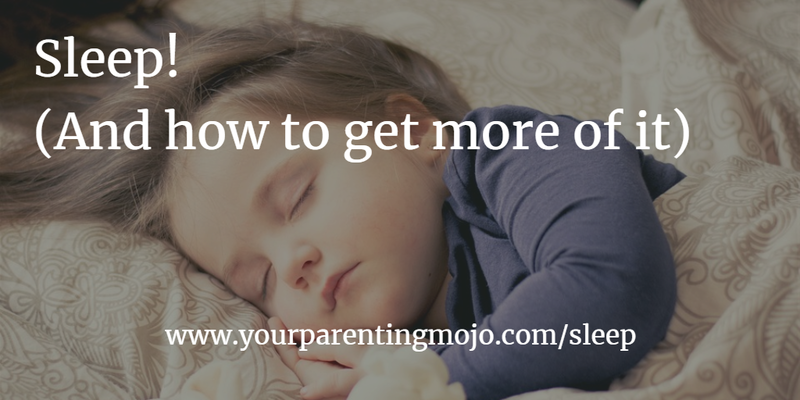 So if you’re really interested in this research and in having me do all the work in terms of keeping on top of it for you, you really should head over to yourparentingmojo.com and enter your email address in the box at the top of the screen to subscribe there. As I’ve mentioned before, if you’re only subscribed through iTunes I never get your email address and I actually never even find out that you subscribed, so there’s no way for me to send a newsletter to you. So head on over to yourparentingmojo.com and subscribe to the show! Seems like we’re on a roll lately with topics that I’ve resisted doing for a while – we did an episode recently on potty training, or ‘toilet learning,’ as I prefer to call it. And I’ve been getting quite a lot of questions over the last few months about sleep – mostly around how to get more of it. I’d resisted doing an episode on this for much the same reason as the potty training episode – there are books out there on this topic as well, and Facebook groups, and plenty of people making a living from doing nothing but advising parents on how to get their children to sleep. But the questions kept coming! And so we’re going to talk about them today. We’ll do what we usually do with these kinds of episodes – take a tour through the anthropological literature and find out just how weird our Western, Educated, Industrialized, Rich, Democratic societies are, and from there we’ll reframe how we look at children and sleep before we discuss ways that we can all get more of it. And I should say that as is typical with the show, we’ll look at sleep primarily through the lens of caring for toddlers and preschoolers. We’ll detour perhaps a little more than usual into learning about younger babies just because that’s the population on whom a lot of research has been done, but we’ll focus primarily on the types of problems that parents of toddlers and preschoolers tend to have, and what we can do about them. Let’s talk just a little first about why children sleep – it’s because they really do need to do it! Just a couple of the amazing things that happen during sleep is that memories are consolidated, stabilized, and perhaps enhanced (which has obvious implications for a child’s performance in school), and memories may actually be assimilated into the child’s cognitive matrix, which allows a cohesive view of the individual’s world to develop. Pretty cool stuff. Sleep problems in childhood are associated with memory and learning impairments, difficulty in regulating mood, attention and behavioral problems, as well as hyperactivity and impulsivity. Short sleep duration is associated with overweight in childhood, although I should caution that for many of these issues we aren’t sure whether sleep problems cause these effects or whether these effects cause the sleep problems. So not getting enough sleep is a problem because when you don’t sleep as much you miss out on all the benefits of sleep that we’re really only just starting to understand. So the first place I looked when I wanted to learn more about how children sleep in other cultures was David Lancy’s book The Anthropology of Childhood, and I was absolutely shocked to find that there’s nothing at all in it about sleep. Luckily there is some published literature about it and all the studies seem to pretty much give the tour of the same cultures and their approaches to sleep. Perhaps we shouldn’t be surprised to find that there’s a link between cultures that value interdependence between people and co-sleeping, and cultures that value independence and individualism and sleeping alone. In non-western countries, cosleeping is very much more common than in western countries. Ninety-three percent of Indian children aged 3 to 10 years cosleep, as do 80% of Japanese infants, who typically stay in the parental bed until at least school age. 45% of Korean children aged between 1 and 7 bed share, as do 45% of Egyptian families where the bed typically has up to four sleepers. Cosleeping is common in Brazil: from isolated communities of indigenous people to the urbanites in Sao Paolo, not less than 80% of children under 10 years of age co-sleep with parents. So in almost all cultures around the world, babies sleep with an adult, while older children sleep with parents or other siblings. I should also be clear that I’m not for or against co-sleeping; we didn’t do it in our household primarily because I found I couldn’t sleep with my daughter in our bed. She spent her first four months in a bassinet right next to our bed and most of the time she could be lifted back into it after nursing in the night. Occasionally in the early mornings she would fuss and seem like she might not settle so I would leave her in bed with us, with her taking up over a third of the bed next to the bed rail, my husband taking up over a third on the other side, and me jammed in the middle unable to move for fear of waking someone up or squashing them. I could sleep with just her in the bed if my husband was out, but he’s not really the type to relocate himself out of the marital bed so we stuck with the bassinet. So why the huge disconnect between Western cultures and the rest of the world when it comes to bed sharing? Well, there are a number of factors at play which are reviewed in an excellent paper by Professor McKenna at the University of Notre Dame, who holds pretty interesting dual appointments in the Department of Anthropology as well as in the Behavioral Sleep Laboratory. He tells the following story: apparently during the last 500 years in major European cities, a relatively sizeable number of poor women with no access to birth control confessed to Catholic priests that they had deliberately laid on and smothered their infants as a way of controlling their family size. The priests threatened excommunication, fines, and imprisonment, and infants were at some point in this period “banned” from parental beds. The legacy of these events have converged with other changing customs and values such as the rise of privacy, self-reliance, and individualism that support the children’s place of rest being in a different room and not just a different bed in the parental bedroom. The rise of romantic love made a further contribution to prevent the child from intruding on the conjugal bond; Freud was a proponent of the idea that children should not watch their parents’ sexual activities, although more recent research has shown that children are not harmed by seeing these activities early in life. The role of fathers shifted as well, as the father-figure became authoritarian figures who engaged in limited physical contact with their children. In the early part of this century, psychologists, pediatricians, and new-found ‘parenting experts’ promoted allegedly science-based sleep patterns that were compatible with the western cultural values of individualism and autonomy. In the second half of this century we became especially enamoured of technological solutions to problems – we substituted “superior” formula for breast milk, and we put children in swings and rockers as a replacement for the sensory exchanges previously achieved through bodily contact with the mother. All of these factors combine to create an environment where parents feel highly uncertain about their own instincts with regards to parenting in general and sleep in particular: they look to expert knowledge rather than trusting their own instincts. As an aside here, I would like to acknowledge the apparent irony of a podcast that is based on exploring research-based approaches denigrating the use of science-backed recommendations in parenting. I do still value a research-based approach to parenting, but as regular listeners have probably noticed by now, we always make sure to do that within an appropriate cultural context. This is why we usually take a look at the anthropological literature before we get into the science just to see how other cultures around the world do things and give ourselves a better perspective on whether or not our approaches – and our children’s responses to those approaches – are strange or not. In some cases, like with tantrums, we find that while tantrums aren’t universal, children in many cultures do have them. It isn’t our weird parenting that has created the toddler tantrum. But when we look at sleep problems, what we find is that a number of these problems are a direct result of our approach to sleep. In other words, if we weren’t trying to get our child to sleep in their own bed in their own room, we would likely experience something closer to the literally zero incidence of sleep problems that is reported by parents in some other cultures. The proportion of US families who bed share with their infants is on the rise, from 5.5% in 1993 to 12.8% in 2000, with the most likely explanation being the re-emergence of breastfeeding as a cultural feeding norm. Families who breastfeed are more likely to cosleep than families who don’t, and while some parents fear that co-sleeping will reduce the child’s ability to fall asleep by themselves, people who have a preference for interdependent relationships see cosleeping as a way to enhance these relationships. Couples’ marital relationship is also related to their perception of bed-sharing – Canadian couples who bed-shared in reaction to their child’s problems in getting to sleep reported lower marital satisfaction than parents who had made a deliberate decision to intentionally bed-share, and a similar finding was replicated among Italian parents. Mothers who bed-share have also reported increased rates of depression than non-bedsharing mothers, although the direction of effect is unclear – we don’t know if more depressed mothers choose to bedshare, or if mothers are not getting enough sleep because of their child’s sleep problems which contributes to their depression, and choose to bedshare as a way of getting some sleep. Breastfeeding and cosleeping together have been shown to provide some protection against Sudden Infant Death Syndrome, or SIDS. Of course it may not be bed sharing per se that is actually the dangerous thing, it’s bed sharing on the typically plush, soft, western-style pillow-topped mattress surrounded by sheets, duvets, and pillows that’s the dangerous part. In most cultures where bedsharing is practiced, us pampered westerners might raise an eyebrow were we to see what passes for a ‘bed’ in other cultures – typically it’s a mat on the floor. While there is some danger that someone will roll onto the child no matter what surface they sleep on, there’s far more danger that the child will become trapped or smothered when they’re surrounded by things that can trap or smother them than when they’re lying on a hard flat surface on the floor. Cross-cultural data shows dramatically lower rates and even the complete absence of SIDS in cultures where mother-infant cosleeping and breastfeeding are the norms. It’s possible that the intricate interrelationship of sleep contact and breastfeeding helps the infant to become aroused after periodic pauses in breathing, rather than failing to become aroused and becoming a victim of SIDS. What we’re getting at here, of course, is that lots of things related to sleep are culturally determined. If your culture prizes strong relationships between people then sleeping together probably seems pretty attractive – and indeed, for most of human history, strong relationships between people in your primary group were the way that the human species survived. What us Westerners are left with is the notion that the sleeping patterns that are species-wide in virtually every culture except our own is seen as inherently highly likely to be lethal, while sleeping alone in a crib is assumed to be healthy, beneficial, and safer. A variety of studies have shown that sleeping away from the mother appears to be a stressful experience for the child, who takes longer to get to quiet sleep and spends less time in quiet sleep when he sleeps in a bassinet in the hospital compared with being in skin-to-skin contact with his mother, which was probably the way that infants and children slept with parents throughout most of human history. So as we think about goodness of fit, let’s consider bedtime routines. Doesn’t everyone have a bedtime routine? It turns out – no they don’t! It’s pretty common in Italy for families to have long, leisurely dinners – sometimes very late into the evening – and parents expect children to simply fall asleep when they’re tired. The might be in someone’s arms or in a nearby stroller, but certainly the adults aren’t going to stop what they’re doing to put a child to bed. If the child has a biological preference for being up late at night and sleeping in in the morning, then there’s a good fit between the child’s biological needs and the culture in which they find themselves. If the child is more of an early riser than a night owl, though, he finds himself in trouble – and probably his parents are in trouble too. In Western countries we seem to have a very ambivalent relationship with our children’s individuality – during the day, we surround our children with all kinds of stimulating activities and allow them to choose which is most interesting to them; we expect them to gain a high degree of independence from an early age and it can be common among parents to compare the age at which a child first engages in certain behaviors like sleeping through the night (as well as potty training). During the day, we aim to create an emotionally secure relationship with our child and we attempt to respond to their needs. Yet our relationship with our children’s sleep much more closely mirrors our relationship with their food, which is to say we don’t trust them. (We did a whole episode on how to get a toddler to eat vegetables a while back – it turns out that using vegetables as a ‘gateway food’ to get a desired food just makes them dislike the vegetable more than they already did, and the only predictor of whether a child will eat vegetables is their liking for vegetables). So just as we set up ‘deals’ where a child has to eat more of one food to get another, and we ask them repeatedly ‘are you sure you had enough to eat’ (which causes them to not trust their body’s own signals that they are full, which can lead to overeating), we tend to set a somewhat arbitrary time for bedtime, take the child from their highly stimulating environment to a non-stimulating environment away from the comfort of parents (which can be very stressful for a child), and tell them to go to sleep whether or not they are tired. When you put it like that, it sounds kind of crazy, doesn’t it? We attempt to bridge the gap between the high stimulation and independence of the day with the low stimulation of night using elaborate bedtime routines, and it turns out that Western cultures are pretty much the only ones that do this. One of the things I realized when I was reading this research was not just the fit between the child’s needs and cultural expectations, but also the child’s needs and the parent’s needs. As I read about the highland Maya, I noticed how it’s apparently common for children to participate in whatever is going on around them no matter what time of the day or night it occurs, which is contrasted by the preference of Western parents to have time when children aren’t around. Among the studies I’ve read, there seems to be an inherent assumption that getting the child to sleep at an arbitrary time is for the child’s benefit, when it may actually be as much for the parents’ benefit as the child’s – and I certainly count myself among this number. As an introvert, as well as being someone who is perpetually studying and trying to write papers – or podcast episodes – I need those two and a half hours between my daughter’s bedtime and my bedtime for research, writing, and for mental renewal. Taking her to bed with me when I go is simply not an option, because I don’t live in a culture where there are always ten other people milling around my house chatting until bedtime (and I might go crazy if there were). We Westerners also use ‘transitional objects’ like a cloth or a blanket or a favorite toy, and there was a pretty cool study done in Italy in 1970 that looked at Italians from a rural town, Italians in Rome, and foreign (mostly Anglo-Saxon) families living in Rome. 6% of the rural infants used some kind of transitional object to get to sleep, 31% of the Roman Italian infants did, and 61% of the Anglo-Saxon babies did. The use of transitional objects had an inverse correspondence to parental use of activities like rocking to sleep and co-sleeping, which meant that the more families rocked to sleep and co-slept, the less they used transitional objects, and the researcher concluded that the transitional object essentially becomes a substitute for maternal contact and proximity at bedtime. These results have been replicated within single populations and across populations, including one study which found a very similar result among native Korean mothers in Korea, Korean mothers living in the United States, and Euro-American mothers. Mothers who are interviewed on this topic report that their bedtime practices align with their child-rearing principles, which is to say that Euro-American mothers say they value independence and autonomy, and that this is why they don’t co-sleep, while Mayan parents value emotional closeness and interdependence with their children, and that is why they sleep together. There’s also a correlation between cultures who value the individual distinctiveness of children and sleeping alone, and cultures who don’t celebrate individual distinctiveness and co-sleeping. But it turns out that there’s actually no association between the age at which children learn to sleep through the night or the difficulty they may have had learning to sleep through the night and their self-reliance in daily living skills or their social independence at preschool age, so our tendency to connect the ability to sleep through the night with independence in other arenas may be somewhat misplaced. For I think what may be the first time on this show we can raise our hands up in the air and thank the deity of our choice for the fact that while the vast majority of sleep research has been conducted on white children and parents, there IS research available on the sleep habits of non-white children and parents. Hispanic children get about 30 minutes less of sleep per night than white children do, and black children get about an hour less per night than white children and tend to go to bed later as well. Black children are also more likely to have parents who report that the child is tired during the day, and significantly more likely to nap past age two than white children. Hispanic children are more likely to sleep with a parent than white children, and black children are more likely to sleep with a sibling. White parents are more likely to view their child’s sleep as problematic than black parents, even after adjusting for other sociodemographic variables. A variety of other factors related to race can impact sleep, including the marital status of parents, the amount of structure in the child’s daily schedule, watching TV, the family’s socioeconomic status, parental smoking, and parental mental health. As we start looking at what we might call ‘sleep problems,’ we need to be cautious about interpreting results of studies looking at these. For example, some studies have reported that children who are rocked to sleep or cosleep with parents have more frequent and prolonged bouts of night waking than infants who don’t do these things. But parents who cosleep in Japan and Singapore report no such problems, so why would this be? One astute researcher pointed out that cosleeping in Japan and Singapore is common, and parents are usually present at a child’s bedtime. In North America, parents often choose to cosleep as a last resort, when they realize they’re getting even less sleep when the child is in their own room. So it’s not that cosleeping causes North American children to wake up, it’s that the children who already have a difficult relationship with sleep, possibly due to parental absence during settling and sleep, that are more likely to cosleep than those who have demonstrated that they can successfully settle themselves to sleep alone. One reason Western parents want to get their children to sleep relatively early is that a consistent bedtime is one component of what is called ‘sleep hygiene,’ a catch-all term to describe the habits and practices that are conducive to sleeping well on a regular basis, and is usually found to contribute to sleep quality and high functioning during the day which is particularly important where practices like work and school happen at set times over which the individual has little or no control. For children who live in cultures where their lives are not regulated by the clock, there are few negative consequences to irregular bedtimes because they can just nap during the day when they are tired. One particularly interesting study found that it wasn’t so much the activities that took place as part of the bedtime routine that were important, but the mother’s emotional availability during the bedtime routine that was linked to children’s sleep disruptions. The sample size in this study was small, as they often are – only 45 families, and even more sadly fathers were recruited into the study but because only seven of them interacted with their children for at least 2-3 minutes at bedtime, the researchers couldn’t draw any conclusions about the importance of paternal emotional availability. Emotional availability was assessed using a tool called the Emotional Availability Scales, which determined parental sensitivity (a parent’s capacity ability to accurately read and respond to the child’s signals with warmth and in an emotionally connected way), structuring (scaffolding of children’s activities and setting appropriate limits), non-intrusiveness (respecting autonomy and personal space) and nonhostility (the ability to interact with the child without signs of either covert or overt irritability or anger). By now you will likely be as attuned as I am to recognize some of the cultural norms that are buried even within the scale used to assess maternal warmth – scaffolding of children’s activities is very unusual in some cultures, and respecting children’s autonomy implies something very different from a ‘because I said so’ approach to parenting. Despite the small sample size, the researchers did get results with a moderate statistical power showing that lower maternal emotional availability at bedtime is linked with needing additional interventions after the first attempt to get the child to sleep as well as more night-time wakings, so it seems to matter less that you do a bath and read books and have a drink of water and all the other parts of your routine and more that you are show warmth toward your child as you get ready for bed. The researchers found that mothers tended to show less warmth toward older toddlers than younger ones, possibly because the older ones were starting to develop their own agendas for bedtime that didn’t always coincide with the parental agenda. I should note, though, that another study found that infant-mother attachment measures were not related to night awakenings in another study of more than 1,200 children measured from age 6 to 36 months; the statistically significant factors were the child’s difficult temperament at age six months, breastfeeding, infant illness, maternal depression, and greater maternal sensitivity, which apparently leads mothers to respond to their child when the child wakes up rather than allowing the child to self-soothe. Once we make it through the bedtime routine, we get to the highly-contested topic of self-soothing, both at bedtime and during night-time wake-ups, which has been the topic of so many of the books related to sleep. One set of researchers observed that 61% of parenting advice books containing information about sleep endorsed a so-called extinction method, in which parents gradually reduce and/or eliminate their responsiveness to a child’s crying, while the predominant counter-argument lies with the proponents of “attachment parenting” – which I put in inverted commas because the term tends to be used differently in the popular press than the proponents of attachment theory originally intended – who believe that consistent, sensitive parental responsiveness is critical to the parent-infant relationship. The proponents of extinction typically cite one of two methods – either the parent just stops responding to the child’s cries (this method is called “unmodified planned ignoring”) which is apparently usually followed by a “sharp increase in problem behavior” called a “post-extinction burst,” followed by a substantial reduction of problem behavior over the next roughly five days and a typically low incidence of problems thereafter. An incremental approach uses a ‘graduated checking procedure’ which was popularized in Richard Ferber’s book Solve Your Child’s Sleep Problems, where the parent goes in to see the child after 1-3 minutes and gradually lengthens the period of time between checks. Parents also modify their behavior during the checks – instead of offering a feed, offering to co-sleep, picking the child up for a cuddle or to rock them, parents instead rub the child’s back and tuck them in and limited their time in the child’s bedroom to around 30 seconds. Studies show that this method takes longer to produce the desired changes in behavior, although it reduces parental and child distress. Professor Blampied at Canterbury University in New Zealand notes that just ignoring the child’s cries is not stressful to parents either, but perhaps parents in New Zealand are just more stoic than everywhere else because the posts I see in parenting discussion groups talk about how getting their child to bed is driving them crazy but they just can’t stand to let the child cry it out. One listener who wrote to me requesting an episode on this topic asked me to try to find out whether crying it out is harmful to the child in any way, and on this front I have to say the evidence is not 100% clear but in general it seems to come down on the side of not being harmful to the child. Elizabeth Pantley developed The No-Cry Sleep Solution after failing to successfully use the cry-it-out approach with her own child, and this basically consists of picking the child up whenever they cry, staying with them until they are sleepy but still awake, and then putting the child down in the crib so they can learn what it’s like to self-soothe. There is general support for putting the child down while sleepy but still awake, although the rest of Pantely’s methodology is based on precisely zero research-based evidence. And it would be remiss to conclude this survey of the popular sleep books without mentioning William Sears & co’s book The Baby Sleep Book, in which the cry-it-out approach is “biologically and developmentally wrong that “can sabotage your parent-child-relationship and may make your child “more likely to have ADHD, along with poor school performance and antisocial behavior,” as well as result in a “violent, impulsive, emotionally unattached child.” With a scathing criticism like that, it’s no wonder that parents feel as though Cry it Out is guaranteed to damage their child for life. Before we get to the issue of whether any approach is harmful to a child, we should first examine whether the approaches that rely on some crying by the child are effective. As we’ve already discussed, both the unmodified planned ignoring and the graduated checking approaches have been shown to be successful. They do reduce the number of times children cry out to parents both when initially getting to sleep and during the night. In contrast, there are precisely zero empirical studies showing the efficacy of reducing time to get to sleep or number of night wakings using immediate responding strategies. Back on the topic of whether behavioral approaches are harmful to the child, the authors of the book Great Myths of Child Development, which I discovered in the course of researching this episode and which you’d better believe I’m going to read in greater depth soon, also looks at some of the many studies that William Sears references in The Baby Sleep Book. They describe one in particular that Sears describes as follows: “researchers at Pennsylvania State and Arizona State universities found that infants with excessive crying during the early months showed more difficulty controlling their emotions and became even fussier when their parents tried to console them at ten months.” The primary finding of the study that this quote refers to was correlational in nature (so the authors could not show which factor causes which), and showed that babies who cried a lot whether they were in or out of their crib at six weeks old were more likely to have a negative reaction to a frustrating stimulus in a lab situation when the child was 10 months old. The study had nothing at all to do with sleep in general or even behavioral interventions in particular, and yet it is used to suggest that the cry-it-out approach leads to “difficulty controlling emotions.” The Myths of Child Development authors say that the goal of the study was to examine the relation between crying and self-regulation, and it basically showed that temperament is fairly consistent in a baby’s first year across settings. The study is not evidence that the cry-it-out approach causes emotional damage. Apparently all of the other research studies cited by Sears et al. are subject to a similar critique. One very small study of only thirty five children again in New Zealand, and in which the researcher thanks our Professor Blampied for assistance, found that a sleep intervention actually increased children’s emotional attachment with parents over the course of the treatment, although the researchers do note that it’s possible that the parents in the control group rated their children more favorably initially because the parents were less bothered by these children’s sleep disturbances, or the parents were more flexible and accepting of the children. This study gets cited again and again as an example of how sleep interventions do not harm children while I would caution that it was far too small to draw any kind of generalizable conclusion, and a later study failed to replicate the finding. I’m also cautious when I find one professor’s name attached to many studies with a particular finding because sometimes scientists develop a pet theory that other scientists don’t find any evidence for. I found another study that confidently declares that there are no harms associated with behavioral sleep interventions five years after the intervention took place based on a questionnaire about the child’s sleep patterns and more general quality of life, as well as by collecting saliva from children which contains cortisol, a hormone that exists normally in the body but is also produced in response to stress. The researchers found that the proportions of children with mental health problems, quality of life problems, and chronic stress as measured by cortisol levels were essentially the same in children who received a behavioral sleep intervention as those who did not. But if you dig a little deeper into both the methodology and results, you find things that raise an eyebrow or two. Firstly, regarding cortisol levels, the researchers asked parents to obtain saliva samples from children 30 minutes after waking up, and before lunch. Baseline cortisol levels are highest in the body in the morning and tend to decline over the course of the day, so the researchers hoped to avoid the morning peak by waiting 30 minutes after wake-up time. But cortisol produced in response to stress has a half-life of about 1-2 hours, meaning that when a child experiences stress their body produces a lot of cortisol, about half of which is gone 1-2 hours later. So we wouldn’t really expect there to be any residual cortisol left over from a spike caused by stress at bedtime by the following morning or lunch. It would have been far more interesting to understand whether the child was stressed during or immediately after the intervention, but I suppose sampling problems would make that difficult – you might find yourself with a child who won’t go to sleep unless you make him spit into a plastic tube first. Secondly, the researchers kind of buried the lede of the whole follow-up study: the control group of parents whose children did not receive the intervention reported that 6.9% of their now six-year-olds had what the parents deemed to be some kind of sleep problem. Among the intervention group, that number was 9%. Now, firstly, we should acknowledge that while the intervention group was specifically taught how to use behavior modification techniques to adjust their child’s sleep patterns and the control group was not, we can’t be sure that the control group didn’t consist of a crack set of researchers who were perfectly capable of researching and implementing these kinds of methods themselves without a nurse telling them how to do it at the child’s well-baby check-up. So that’s a pretty important confounding variable that doesn’t seem to have been taken into account. And secondly, it seems as though sleep problems either largely become resolved on their own, or parents simply adjust their mindsets and stop thinking of them as problems because the parents of six year olds who didn’t get the training reported a LOWER incidence of “sleep problems” than those who did. So all this is to say that we can’t be sure that crying it out isn’t harmful for children; the best evidence we have says that it probably isn’t harmful, but that evidence isn’t of great quality. There’s also the issue of parental sleep to consider – parental sleep and mood do tend to improve dramatically after a behavioral-based intervention, and it’s possible that long-term sleep-deprived, stressed, and possibly depressed parents may represent a greater threat to attachment security than a week or two of not responding to the child’s cries. One study found that having nurses deliver hand-outs on the ‘graduated extinction’ and ‘camping out’ methods of sleep training (this last one involves staying in the room with the child but withdrawing further and further over a period of a couple of weeks) and writing a personalized sleep training plan resulted in improved mental health of mothers after 12 months, compared to a control group who didn’t receive this information from the nurse. Further, it may be impossible to tease out the chicken and the egg of attachment and sleep – while research has indicated that infants with an insecure-ambivalent attachment relationship with their mothers do cry more at night, we don’t know whether the night crying is a cause or an effect of the attachment relationship. A review of the literature from a behaviorist perspective shows us that bedtime routines are behaviorist in nature – each step in the routine becomes linked to the next, with the idea being that if you do the right things in the right order, the result (sleep) will follow as the last link in the chain. Professor Blampied (again) notes that ‘parent-provided stimuli, arising from their actions or just their presence, if they overshadow the natural stimuli of the bed environment and become controlling stimuli for falling asleep, will then have to be provided every time if the child is to go to sleep. This may be acceptable during infancy, but parents may find this burdensome as their child grows older. To avoid this, “parent-associated stimuli should be withdrawn from the last phase of the bedtime routine as the child grows, leaving naturally occurring bed cues to control the final discriminated operants in the chain.” In other words, falling asleep with your infant is lovely and snuggly, but over time your infant will come to depend on your presence to fall asleep. If you are a proponent of cosleeping then this remains a lovely thing but if you didn’t really like it much in the first place and you just did it to get your infant to sleep, or if your preferences shift and you decide it’s time your child developed the ability to self-soothe, then you have something of a problem. This tends to be where elaborate bedtime routines have their origins, particularly as the child adds ‘just one more thing’ to the routine in an attempt to delay sleep ever further. The behaviorists point to the importance of good sleep hygiene (by which they mean routines that don’t involve the parent being present as an aid to sleep) “and supporting parents through the distress and disruption that accompanies implementing them is one intervention.” If you read between the lines you hear a lot of screaming children who don’t like the new routine and who protest the new absence of their parent as they try to go to sleep. An alternate suggested approach is to have the parent stay in the room but refuse to interact with the child, which is apparently also very effective but reminds me a lot of the Blank Face experiment that Dr. Laura Froyen told us about, in which babies became very distressed when their mothers refused to interact with them. It’s not at all clear to me what makes this method successful when we know that children find non-interaction from parents to be a very stressful thing. Perhaps the children are doing what children and even adults in Bali can apparently do, which is to fall asleep at the drop of a hat during a stressful event like being a servant accused of stealing or being a toddler present at the birth of a younger sibling. Sounds strange to Western ears, but it’s apparently true. I have to say that one thing that struck me from all the research I read on sleep training is that all the researchers are essentially giving variations on the same advice. I mean, maybe this isn’t rocket science, but one study will compare nurses giving information to parents at a well-baby visit, while another one gives the information automatically online after the parent completes a questionnaire about their child’s sleep. The actual suggestions given are all the same – if you want your child to sleep on their own in their own bed, you basically have to decide how much crying you can put up with. If you can’t stand to hear your child cry then the gradual extinction method will take longer but will get you there in the end. If you don’t mind hearing it intensely for a long time on a few nights, your child will get the idea faster. That’s really all there is to it, unless you count the study that was funded by Johnson & Johnson that includes the importance of a bath (using a provided wash product) and a massage (using a provided moisturizing product). Debra Bass, the president of J&J’s global baby franchise, says this kind of research “separates Johnson’s from other baby skincare brands by going beyond products to “deliver a bigger experience backed by science.” Of course, the study tested the bath/massage/bed routine compared to families’ normal pre-bed activities among families in which the parent had identified their child as having a sleep problem, so it would be sort of surprising if instituting a relaxing bedtime routine didn’t have much of an effect for these children. It would have been much more interesting to compare families who used the bath/massage/bed routine not using Johnson’s products with those who did – I’d be willing to put money on the fact that there would be no differences between the two conditions, but I suppose that wouldn’t make such a good marketing story. FYI, Johnson’s uses the data that parents put into its Bedtime app for more research on sleep that they can use to make marketing claims, and I assume the app subtly reminds you about the importance of Johnson’s products to your baby’s sleep and therefore wellbeing, which helps Johnson’s to “own every conversation about sleep” and encourages parents to keep buying their products. Do what that information what you will. So for those of us parents whose children do sleep in their own rooms, in a way we make our own beds and now we have to lie in them, as it were: we place a high value on something a child may well find it difficult to do, and then we get super stressed out when they can’t do it, which causes us to go crazy trying to find a solution to the ‘problem’ that is only a problem in the first place because of our expectations. We do, of course, have to look beyond the macro view of cultural expectations to a micro view of what works for individual parents – if I get up for my daughter in the night, it takes me at least an hour to get back to sleep, whereas it takes my husband approximately five minutes. We have been lucky that our daughter does sleep through the night the vast majority of the time, but on the rare occasion when she does wake up I usually don’t hear it because I’m wearing earplugs, and he’s the one to go and see what she needs. If she was in our bed, I’d have lost that hour of sleep, but because she’s not, I get to sleep through – and you’d better believe I’m a happier and more productive person – and a better parent – because I got that extra hour. I was surprised to learn that when researchers looked for a correlation between executive functioning of 12 and 18 month-old children and the number of night awakenings that their parents reported, they essentially found few differences between children who woke up often during the night and children who didn’t. This research is in its early stages, but to me it lends support for the idea that self-soothing is something that may be more important to the parents than to the child. One or both parents may have to work during the day, particularly here in the U.S. where paid maternity leave may be close-to-nonexistent for the majority of the population. As an example of the idea that something is only a problem if parents perceive it as a problem: children in Sweden typically have their own bedrooms but increasingly over the first three years of their lives, Swedish children tend to come into the parents’ bed in the early morning. I would not be at all happy with this arrangement because I tend to get my most productive sleep in the early morning hours, but Swedish parents tolerate and even encourage this behavior because they feel as though parents should be available to children whenever the child feels a need for contact, and also in part because working parents see so little of their children during the day that they want to “fill our tanks with love at night sleeping together.” This practice has even been observed as somewhat common among older parents in Boston, Massachusetts. What might be the kind of problem that would drive me to distraction if I experienced it is nothing more than a normal part of parenting in Sweden and, apparently, some places in the U.S.. So, as we wrap up, the evidence shows that sleep training methods involving some variation of not responding to a child’s cries or gradually withdrawing responses over a period of time is an effective way to get children to self-soothe. Further, the evidence suggests (but is not conclusive on this front) that while children do experience some distress during behavioral modification approaches to sleep, that they are not harmful to children in the long-term because children are not fragile beings who will wilt if they experience any stress, and in fact the experience of stress and even of occasional parental unavailability can set the stage for positive mental and emotional development later in life. We should note, though, that behavioral modification of sleep isn’t appropriate for children less than about six months of age, and shouldn’t be used if the parent can identify a clear need other than that of parental presence that the parent can satisfy – so if the child has a wet diaper, change it. If they’re too hot, too cold, too thirsty, or whatever – help the child to fix those things once only, and then consider not responding after that. And, of course, if they have a diagnosed medical problem or you think medical factors could be impacting their sleep, you might want to consult your doctor. And don’t feel as though sleep training is the only tool available to you – what pretty much all of the behavioral modification researchers fail to mention is that having a child sleep through the night in their own bed is a cultural choice, and the child’s failure to do this is evidence of a ‘disorder’ only inasmuch as the parents perceive it to be a problem. So if your child doesn’t sleep through the night in their own bed but you don’t mind getting up, then it’s not a problem. And if the only way your child will sleep is with you in your bed and you’re fine with that and can envision being fine with that for the foreseeable future, then that’s also not a problem. But do consider that the longer you ‘live with’ a situation that you consider to be a problem without fixing it, the more entrenched the ‘problem’ behaviors will become until they are very difficult to change, so if you feel a change is warranted, you might want to make it sooner rather than later. You’re welcome, Jessica – glad it was helpful! I really enjoy your podcast! This one was also very insightful. You introduced me to RIE and I like this approach to parenting. It seems so disrespectful to have a child cry it out during sleep training (when transitioning them to a crib) ,but I also want him to learn to self soothe. It’s hard to figure out a balance for me. Have you had success with RIE and sleep training? Thanks so much for your question – sleep really is an issue that I consider very much to be part of the ‘dance’ that I think of parenting as – your son is your partner, and you both give and take. I think the upshot of the sleep episode is “children evolved sleeping next to their parents and this is how they get to sleep most easily, but this approach doesn’t fit well with how many parents today want to live their lives.” And, ultimately, a lot of it is related to how much crying you can/want to tolerate. The RIE stance on this is that self-soothing is a skill that your child will learn if you allow him the space to do this. Magda Gerber says “Your goal is to help your baby develop good sleeping habits,” but she does not acknowledge that “good” sleeping habits are very much culturally determined. She is also silent on exactly how to achieve these good habits: she says “Some children seem to really need to cry themselves to sleep. Sometimes just letting them cry those extra parent-painful minutes before sleep can be helpful. Theories and fads keep changing, from advising you to sleep together in the “family bed,” to putting the infant far enough away to not be disturbed by his crying” – and then she offers no opinion on where on the continuum of family bed<>Cry-It-Out is ‘best’ according to RIE, which isn’t very helpful.